Enter to learn… ....Go forth to serve. And - check out the many benefits to you, as a student, for participating in community service, service-learning, and/or civic engagement by clicking on Student Benefits! SERVICE-LEARNING COURSES . We collaborate with TSU faculty to assist in developing service-learning classes and, with more than 200 Nashville nonprofit organizations, to develop volunteer and service-learning opportunities for our students! Faculty are invited to access resources through the "Faculty Resources" tab. Over 213 service-learning courses are taught each academic year, providing over 3,000 students the opportunity to apply classroom knowledge to everyday life. Our UNIV1000 Freshman Orientation: Service to Leadership, introduces freshmen to our local community by involving them in eight hours of service during the first semester. Additionally, service-learning at TSU exists at all levels, in all disciplines, and makes a difference in the lives of our students as well as in our community! A Service Scholar must commit to earn at least 200 hours of Community Service by the time they graduate. Individuals with higher GPAs and more service hours will receive additional accolades! Application has been reopened! View details. The Metropolitan Nashville Davidson County Community Remembrance Project Coalition ("We Remember Nashville") exists to promote community awareness, education, and public reckoning around racial terror in Nashville (Davidson County), TN through partnership with the Equal Justice Initiative (EJI) and local stakeholders. Led by an intergenerational, multi-gendered, interfaith core, We Remember Nashville will tell the story with dignity, truth, and resilience in order to move toward reconciliation. Opportunities are available year-round in the following areas: Community Engagement and Partnership, Family Contact and History Research, and more. Contact Brittany Paschall via brittany@weremembernashville.org or at (615)422-5129 for more information. YouthLife Learning Centers - near the campus is the Center at 4402 Tennessee Avenue. Volunteers are needed to assist K-8th grade students with homework help, one-on-one tutoring, site assisting, mentoring, translating, and much more! Help is needed through December from approximately 3:30-7:00 p.m. with a minimum of 1 day a week expected from a volunteer. For more information, contact by eMail - admin@YLLC.org or call (615) 905-6826. Visit their website at www.yllc.org. HANDS ON NASHVILLE - offers opportunities throughout the year. To register, go to https://www.hon.org/. Select "Become a Volunteer," then "Sign up/Registration." Create your Volunteer Account. You will then be able to sign up for a project of your choice. The American Red Cross - Nashville Chapter has numerous service opportunities. The Communications Department has a number of opportunities to work in media and community relations, Disaster Public Affairs, social engagement, public speaking, video production and photography. There are also virtual opportunities. For more information about volunteering, please email Karlescia Brookins at ka rlescia.brookins@redcross.org or call 901-395-4551. The American Red Cross Blood Drive also has opportunities for volunteers. For specific information on volunteering for Blood Drives, contact Renee.Jenkins@redcross.org or phone Renee at 615-312-8440. Held at Smithson Craighead Academy in Madison, Tennessee - begining August 21st, 2018 through May 25, 2019 - Monday-Thursday 3:00-6:00 p.m. Volunteers are needed to assist with providing snacks, tutor and academic coaching, teaching beginners piano and providing guidance during practice labs. For more information contact Lynora Ivery @ midtownmusicacademy@gmail.com or 615-838-8018. MNPS READING CLINICS: Led by Dr. Tammy Lipsey, MNPS Reading Clinics offer TSU students an opportunity to tutor secondary school students in reading skills. Volunteers are always needed at the 5+ sites across the city. Participants must complete a 4-hour training session and commit to 1 hour a week (2 days/30 minutes). This program is great for pre-teacher service or those in the field of education, but welcomes students from all disciplines. For more information or to sign up to volunteer, please contact tamera.lipsey@mnps.org. Temple Church, 3810 Kings Lane, Nashville - Mondays and Thursdays - 5:30 p.m. to 7:30 p.m.
Tutors will be picked up on campus at 4:30 p.m. in front of the "airplane" and returned to residence halls by 7:45 p.m.
You are served dinner before tutoring sessions and may select the day or days to participate. You will earn 3 service hours for each visit. Contact Mary Cotten, Coordinator at 615-969-4946 or email: educationalenrichmenttemple@gmail.com. AVAILABLE ANYTIME! Little Pantry That Could...and it's an on-campus activity. Collect plastic grocery bags for the Little Pantry That Could. Grocery bags may be taken to the Center for Service Learning and Civic Engagement in Holland Hall 306. In addition to grocery bags, other items are needed: can openers, socks, and sweatshirts for both men and women. 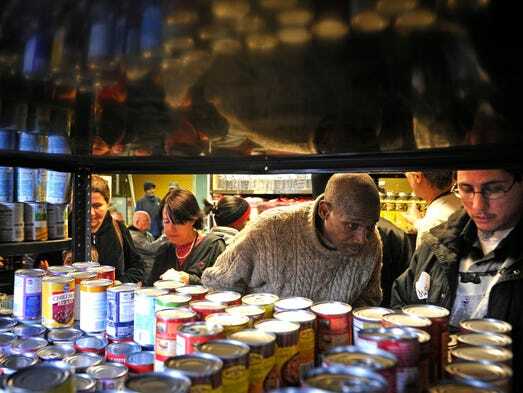 Volunteers are needed each week to help stock the pantry. Help put food on the shelves, bring in food from donors, and help get organized for the 200 families who will come on Saturday to get food. Call or Text 615-260-5769. Monday-Friday - 3:00 p.m. - 6:00 p.m.
For sign up and additional information please call 615-289-2716. Hadley Park Community Center needs tutors and homework help especially for reading and math. Students ages 6 to 14 are typically at the center between 3:00 p.m. and 6:00 p.m. Monday through Friday. This can be a one day a week or more, but you should commit to return on a weekly basis for a couple of months. The Hadley Park Community Center is within walking distance of TSU at 1037 28th Avenue North! Contact Shatika White, Program Coordinator at shatika.white@nashville.gov. Volunteer Service Requirements: 1) background check and 2) complete a volunteer form for Metro Parks. Located at 402 22nd Avenue North, The Next Door provides services for women and their families impacted by addiction, mental illness, trauma and/or incarceration with Christ-centered compassionate care. Volunteers are needed for a variety of activities including helping to serve lunch or dinner, donating copy paper, and providing paper dinner napkins. Or check with the volunteer coordinator for the most current needs. Email Yvonne Chumchal (yvonne.chumchal@thenextdoor.org) or call 615-251-8805 ext. 219. *wrapping presents during the holiday season. Click here for the Volunteer Application Form. Complete the form and email to coleary@renewalhouse.org. Allow one week for review and response. The Siloam Health Center provides health care for those who have nowhere else to go. Patient support volunteers are needed at the Siloam Family Health Center for prayer care, interpreters of both Spanish and Arabic, administrative help, and patient resource assistants (morning and afternoon shifts). Please click on "How to Become A Volunteer." Questions may be directed to Wes Harrell, Volunteer Manager - wes.harrell@siloamhealth.org.